Hamilton may have escaped relegation for another year but they finished bottom of the league when it came to their Sportscene appearances. Accies - who avoided falling through the Ladbrokes Premiership trapdoor by beating play-off rivals Dundee United over two legs last week - closed BBC Scotland’s flagship highlights programme on 10 occasions. That was more than any other side - while they also opened the show the fewest. In fact, they topped the bill just once throughout the whole of the 2016/17 season and even then, the Lanarkshire outfit’s supporters had to wait until May 14 to see their team kick off the Sportscene action with their crucial relegation crunch against local rivals Motherwell. Relieved Accies boss Martin Canning was delighted to see Hamilton escape a slide into the Championship but admitted his team’s lowly rating with the broadcaster was not something that worried him too much. He said: “To be honest, it doesn’t bother me because the most important thing is that we get our job done. Unsurprisingly, runaway league champions Celtic also came out on top of Press Association Sport’s Sportscene survey, opening the weekend highlights review no fewer than 17 times. Next up were Rangers with 14 outings at the top of the show but Aberdeen, who finished the campaign second and were also runners-up to Celtic in both domestic cup finals, managed just six headline appearances. Like Hamilton, Kilmarnock were also treated to just one opening slot and were left to wait until last a further nine times. Partick Thistle enjoyed their best league season in 36 years as they broke into the top six for the first time but their supporters were also kept waiting as they closed the show on nine occasions. Celtic did take their turn at the bottom end of the show three times, while Gers went out last once. However, all of the games featured had taken place on Friday nights and were broadcast on Sportscene’s regular Sunday afternoon slot. David Harron, executive producer for sport at BBC Scotland, explained how the Sportscene team draw up their programme schedule. “The Sportscene running order is ultimately a matter of editorial judgement each week,” he said. “The key factors that the programme producer needs to weigh up are the quality of a game, the importance of the game, likely audience interest in a game and also the level of coverage. 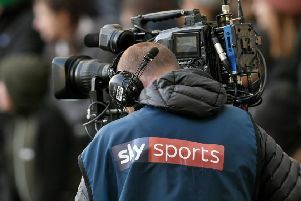 “This last point is something which is not always appreciated by supporters but while most non-live games are now covered as multi-camera outside broadcasts (OBs), two games per week were covered using only two or three cameras due to a contractual situation between the SPFL and one of their broadcasters. “Our understanding from the SPFL is that from next season all the games will be covered by at least a small fully mixed OB unit which should enhance the offer for the audience still further.